The basic task of an effective alarm system is to provide information about detection of a threat. This is why devices belonging to the "communication and messaging" group play a very important role in the system, regardless of the technology used. The wide range of their application capabilities enable them to be used for effective notification of the parties interested in system events, transfer of information to the agencies responsible for ensuring physical security, remote configuration and management of the alarm system, control of building automation elements, etc. as stand-alone devices, e.g. when supervising automation processes in locations that do not require installation of an alarm system. The modules have built-in GSM phones that make it possible to use a wide range of services offered by mobile operators. Communication via the GSM network can be used for implementation of alarm reporting by transferring data about the system state to the monitoring stations of security companies. 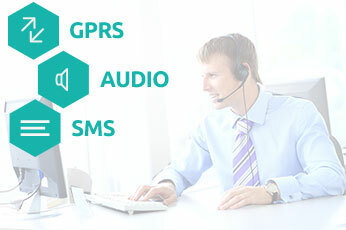 The outgoing transmissions from the modules can be carried out in several ways: by using voice path, SMS messages or via GPRS. As regards personal messaging, SMS messages and PUSH messages, in addition to regular telephone calls with voice messages, work perfectly well when implemented on mobile devices. The modules can use them to provide concise, unambiguous information about the most important events in the system. Each module has a group of controllable outputs that can be used to control the alarm system and execute automation functions, such as control of lighting, heating, blinds or gates. Individual actions can be triggered in several ways, including by sending an SMS message, from a mobile application, a configuration program, or by using the CLIP service. 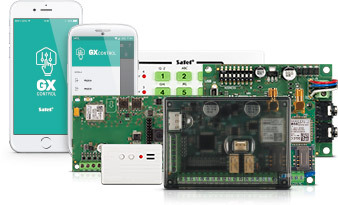 The GSM-X and GPRS-A modules can be operated remotely via the GX CONTROL application for mobile devices. It is an extremely convenient solution enabling control and immediate verification of the communicator status from any location in the world. For their configuration, you can use the GX Soft program, which is provided with an intuitive interface. The GPRS-A universal monitoring module, in addition to its basic communication functions, can be used to monitor parameters from the connected analog and digital sensors. According to the concept of the Internet of Things (IoT), these data can be sent on-line using open communication protocols, to be used in databases, reports, visualizations, etc. The GSM-X universal communication module offers a number of other, additional features and possibilities. In the event of a landline telephone network failure, it will use the GSM network as a backup communication path. 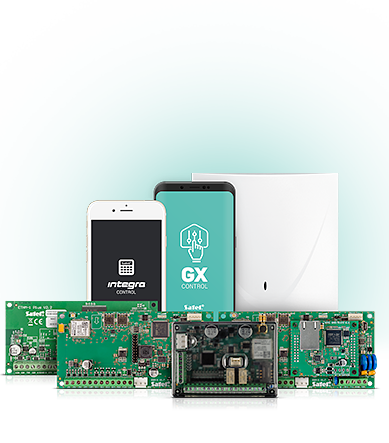 It can also act as a GSM gateway or allow remote access to management (DLOADX) and configuration (GUARDX) of the INTEGRA and INTEGRA Plus control panels. When used in conjunction with GSM-X-ETH (a dedicated Ethernet module), it can conduct extremely efficient Dual Path Reporting using two media: Ethernet and GPRS transmission. INT-GSM is the bus module that enables the INTEGRA and INTEGRA Plus series control panels to communicate via the GSM network. The device allows remote control of the alarm system through the INTEGRA CONTROL mobile application, SMS or CLIP service. It sends PUSH, SMS and e-mail (INTEGRA Plus) notifications and reports events to two monitoring stations (GPRS and SMS). INT-GSM cooperates with the ETHM-1 Plus Ethernet module as a backup communication path for the Ethernet network. Duet can also perform Dual Path Reporting. The communicator provides remote access to configuration (DLOADX) and alarm system management (GUARDX). Ethernet network communicators offer wide possibilities in the field of communication. They make it possible not only to efficiently transfer information to the monitoring station, but to perform additional functions as well. They can be used, for instance, to remotely control and manage the system from a laptop or smartphone. Furthermore, these communicators enable e-mail messages to be used for notification. This option makes it possible for the interested users to receive information about current events in the system. For the systems based on the control panels of INTEGRA and INTEGRA Plus family, with the ETHM-1 Plus module connected, it is possible to remotely program the panels via Internet using the dedicated DLOADX software. Additionally, this module allows remote management of the system from the level of GUARDX software and INTEGRA CONTROL mobile application. When there is a need for centralized administration of multiple systems based on these control panels, communication via ETHM-1 Plus allows you to use the INTEGRUM integration software. It is also possible to integrate such alarm systems with the advanced ACCO NET access control system. In respect of the technology used, the simplest devices are those that use the wired telephone line (landline). They provide the opportunity to ensure all basic functions, including voice messaging, implementation of reporting in various formats, etc. In the majority of SATEL's alarm control panels, such communicators are an integral part of the control panel, so that you can enjoy the possibilities offered by them without having to use any additional devices. 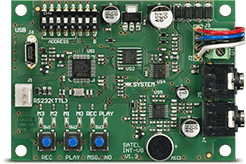 Functionality of some control panels equipped with telephone communicators can be expanded by adding extra modules. The most popular modules are voice synthesizers, whose task is to play back the voice message informing the user about a selected event in the system. The product offering also includes modules designed for interactive system control via the voice menu. In this case, as in the popular helpline systems, you can use the telephone keys to select the required option.